To watch John Miniero at work is to see a man with the energy of someone half his age. Moving swiftly from kitchen to sidewalk as he bakes batches of pizza and simultaneously works on the construction of this year's Christmas presepe, his pace is quick, and his timing perfect. One minute he's adjusting the placement of wiring in the giant display case in front of his Dyker Heights home, and the next he's dashing down the street with a tray of fresh pie for his 98-year old mother. There are good genes in this family. I feel lucky with my own timing too - here to witness the turning-point from Halloween to Christmas presepe. While John works on the new installation, he feeds me cookies, and coffee, and pizza, and beer, and I get the chance to talk to him about his life and his craft. The two are so closely interwoven, it seems you can’t have one without the other. Every inch of his miniature landscapes is a profound expression of his life as a first generation Italian-American. John shrugs off the word "artist," but as you get to know him better, and witness the energy, the love and the sheer ingenuity he pours into his works, you have to disagree. I ask him when he got to the States. He tells me he spent his childhood in Italy, in Sorrento. His father, who worked as a tailor, came to Brooklyn in 1955, and John arrived here a couple of years later, along with his mother and four siblings. He was twelve when the family made their first American home together on First Place in Red Hook. They later moved to Third Avenue and 9th Street, and finally to Dyker Heights. 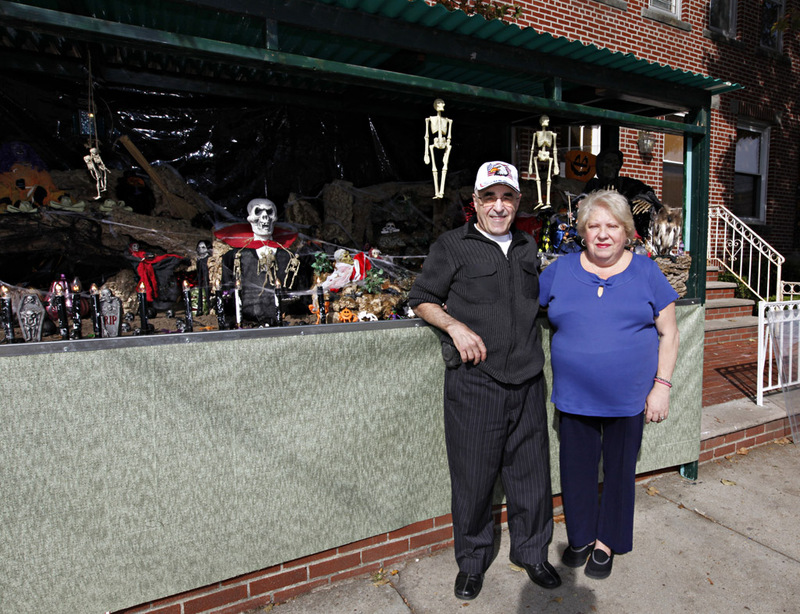 He recalls no problems settling into the States when he first arrived; the close-knit South Brooklyn Italian neighborhoods he lived in absorbed old-country newcomers readily. Trained as a baker, he ran his own business, Sorrento (what other name could he possibly choose? ), for twenty-eight years. The bakery had a couple of locations, on 19th and 20th Avenues. Eventually he sold the business, but from the looks of things, he hasn’t slowed down a bit since retirement. His wife Marie, whose calm seems a perfect balance to John's buzzing energy, tells me he spends a good three hours a day at the gym, and has to keep busy. John tells me his kids have joked he’d be diagnosed with ADHD today. What were the presepi of his childhood like? John says they were made by his father, and occupied a corner of the family’s living room. When John got old enough, he helped with their construction. His father used a base of papier-mâché, and so did John when he first made presepi of his own, and displayed them in the bakery. Later he came to change his materials, building the background and the buildings in the scenes with cork, bought in bulk on regular visits to Naples. His Christmas presepi are peopled by Italian figurines, and lean towards a classical model, while the Halloween versions are haunted by a broader assortment of characters, many of them 99-centers. If you’re able to catch them both, you’ll see their very different looks, and notice how they adhere to and depart from the 'received definition' of presepe form. There are many ways in which John's presepi are exceptional, both in conception and production - every building made by hand! 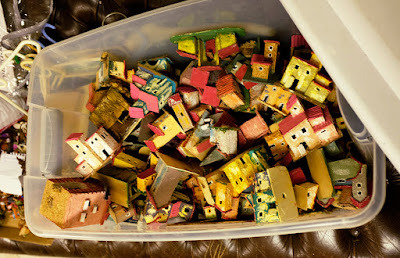 - but the most obvious way they stand out is that they're displayed outdoors, out in his front yard. He says he knows no-one else who makes them this way in New York. The presepe’s origins have been traced to the 13th century and St. Francis of Assisi. and in the standard received history, it reached its ideal form in the 18th Century. This Baroque "ideal" centers around a nativity, but also includes scenes of everyday life, with vernacular figures of the period shown following the trades and customs of the era. This is the "high art" form preserved most faithfully in many churches, museums, and many other public institutions. 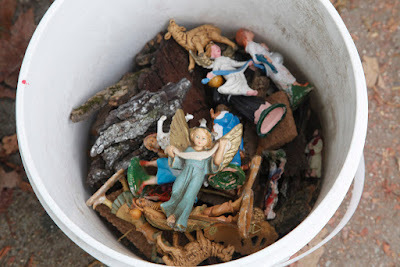 But presepe traditions have changed over time, both in the public sphere and in private homes. 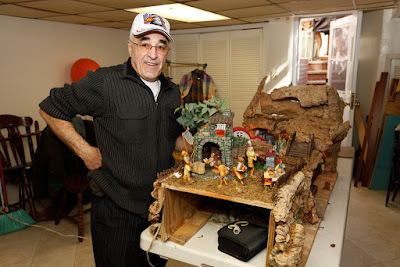 For many Italian-American families the home-made presepe was eventually replaced by a smaller, decorated crèche, and over the generations, the grander, Neapolitan form from which the crèche derived became forgotten. 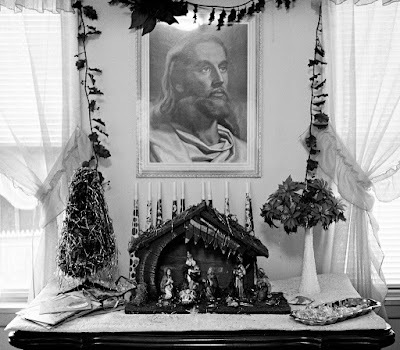 Photographer Larry Racioppo documented his family's Christmases in the 1970's and 80's, and remembers the love and reverence for their little crèche, and how carefully its figures were cared for. 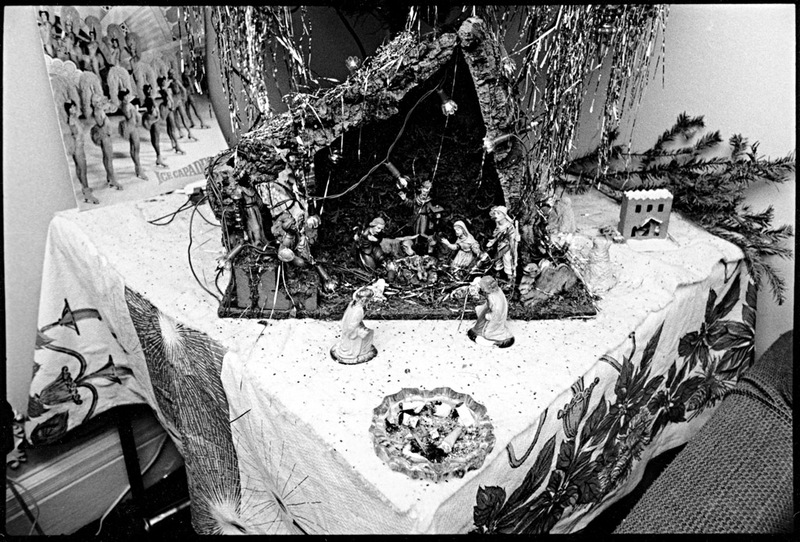 In households where presepi are still made, in Italy and to a lesser degree the States, the presepe is not a display frozen in an idealized, classical form, but is instead a living art form, - unique, evolving, with family history, political commentary, and pop culture references a part of its mix. The ultimate joy in the presepe is not in facsimile, but in making it an expression of self, family, culture, of the past and the present. 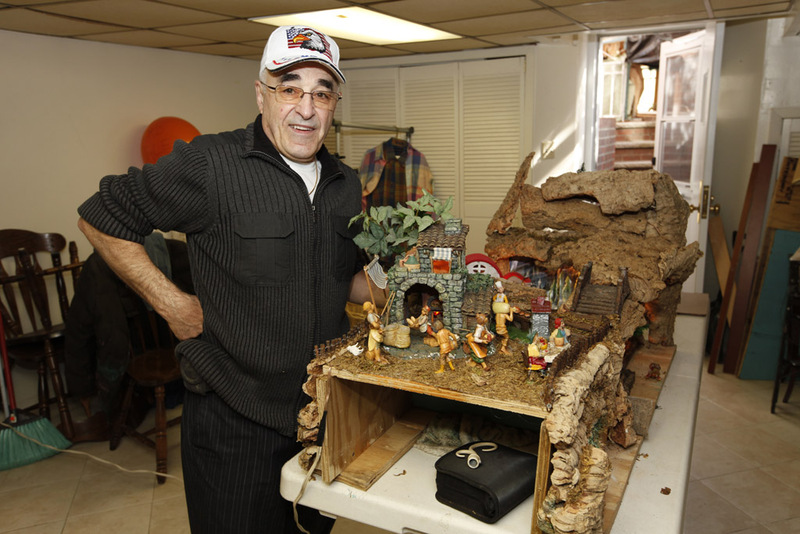 From simple to elaborate in scope, the home made presepe, almost always sited indoors, is an expression both of community spirit and of individual creativity, differing in style or detail each season. It may be essentially traditional, or make humorous reference to cultural events. It may also reference pressing social issues. Joseph Sciorra, Italian-American folklorist and Director for Academic and Cultural Programs at the John D. Calandra Italian American Institute, Queens College, writes of Antonio Vigilante's presepe of 1989, created just months after the murder of Yusuf Hawkins, in Bensonhurst, and specifically designed to promote racial harmony. Sciorra's own presepi have centered on themes as varied as Camping, Baghdad, The South Bronx Circa 1975, and the Watts Towers. John Miniero's Christmas presepe cleaves to classical form, with all Italian figurines and a period setting, but his highly unusual Halloween presepe is a dizzying blend of traditional and contemporary. Vampires and a host of giant spiders invade the streets and the waters of his birthplace. The basement of John's house is the center of creation. While we talk (presepi, family, food, spirited (we'll say) post-election debate), eat, and drink, pans of cookies cool on a kitchen table, while over by the stove a large pot of sauce and trays of pizza dough are ready for the oven. John opens the fridge to show me a bulk buy of mozzarella. Everything in abundance! Given the amount he's baking, it looks like a commercial production scene, especially with the industrial mixer sitting in a corner, but no, John says he bakes mostly for his family. Next to the kitchen the presepe staging center is also grand in scale.. On one table pieces of the Halloween presepe rest on a table, their yearly show over. 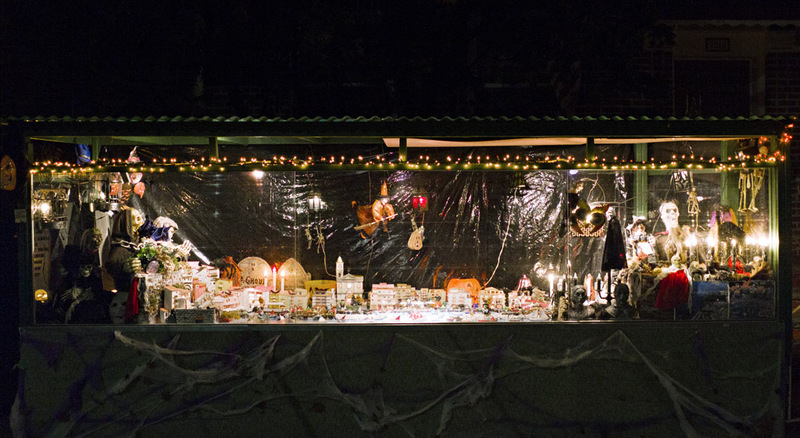 The Halloween presepe centers round a recreation of John's home town and he shows me the photographs on which his work is based. Here, a picture of the house his relatives still live in, and there the house in miniature, lovingly made out of cork and paint and glue. Here the Chiesa di Sant'Anna in a family snapshot and there, more lovely still when made by hand, with a watch in place of a traditional clock face. Somehow the town, reduced only in its size. is right here in front of us in Brooklyn. How thrillingly it's summoned back. 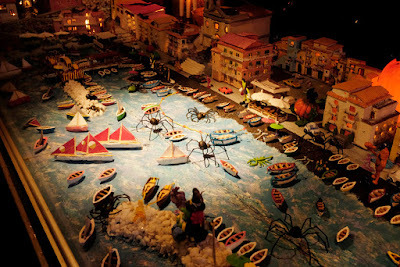 John & Marie show me other photographs, of family back home, of Naples lit up with lights at Christmas. Their faces fill with light too. Even an outsider, British to boot, and brought up on the thin gruel of the Church of England, catches the love and sentiment. Even with my own wonderful Christmases seared into memory (the rural, pagan traditions intruded, even in C of E territory) I'm more than a little envious. Now the main event. When I arrived, the Christmas presepe was starting to take shape outside, with part of it already up. Now it's time to get the rest in. It's a bit like a giant 3-D puzzle, and John's spent the last two months refining this year's display. Ten large sections, mounted on runners and ready to be slid in place, are pieced together. If you look at the back of the case, you can see how the pieces all fit. John assembles the presepe, and I occasionally assist (inconsequentially) but really I'm just a kid again, excited by the chance to look at this miniature world up close, without any screen in the way. John's the benevolent master here, ordering his presepe universe, nudging sections, adjusting the lighting, dusting the scenery and picking up a figures that fall to the ground. Some of the figures are a little the worse for wear, marked with chips and nicks, but that in no way diminishes them. They're veteran troopers, coming out year after year for their performances. The details John has put into his work are a marvel. The craggy cork rocks are carpeted with fresh and dried moss, and inset mirrors reveal characters hidden in grotto settings. The houses, also made of cork, are topped with facsimiles of tile. Mountain streams run through the scene, and fountains play. The fire in a baker's oven burns bright, and the vendor's shiny plaster fruits are tiny, tempting morsels. You want to shrink yourself down in size and inhabit this world. As he works today, passers by stop to greet him and admire his creation. While friends and neighbors are long familiar with his work, he says it's also much enjoyed by newer, Chinese residents. John's house is on the route of Dyker Heights Christmas lights bus tours, but he tells me that the riders rarely get out of the buses for a closer look at the presepe. Perhaps the drivers don't give them the time to linger. He talks of the bigger light shows nearby with a certain disdain: they're more about showiness and rivalry, and who's spent more money than their neighbor than they are about skill, ingenuity and tradition. And you have to agree. His work is an act of devotion, his life an act of giving back. John has a passion for it; each year he adapts and recomposes his presentations, imbuing them with fresh details and rearrangements. He's not inspired by religious zeal; he's the first to admit that he's an atheist. Religion never stuck for him, he says. But the scenes he creates radiate the love and pride he feels for his Italian heritage, both here in Brooklyn & thousands of miles away in southern Italy. He's never really left that first home, and each year he makes it anew, for all of us to share. Thanks are in order - to Larry, who introduced me to John and provided advice and wonderful photographs, to Joseph Sciorra for leading me to work he has written on presepi, and especially, of course, to John & Marie, for their warm hospitality and endless patience during a long visit. Oh and that pizza ... John, it's the best! For more on Larry's work, visit Larry Racioppo Photography, and the current group show, Sanctuary, at the Tabla Rasa gallery, in Sunset Park.